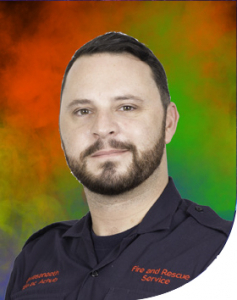 This page is dedicated to LGB communities and has been written by those employees at South Wales Fire and Rescue Service that identify as LGB with their future colleagues who also identify as LGB in mind. Hi, my name is Lloyd and I work in Fire Control for South Wales Fire and Rescue Service. I’ve worked for the fire service for over 8 years and being an openly Gay man was slightly worried before I joined the Service. Working previously as cabin crew, a lot of people identified as being Gay and I knew that this was unlikely to be the case in the Fire and Rescue Service. I didn’t necessarily think for one second that I would encounter any problems but I didn’t know how I would be accepted and if I could be as open as I always had been. However, I couldn’t have been more wrong – I was accepted from day one and have always been able to be myself at work. I have had great support from the various watches I have been on over the years with everything from work to my own personal life. Working in the Fire Service and being on a watch with nine other people really is like a little family. I have been on my current watch for 5 years and we all support each other inside and outside of work, we work long shifts together so we know so much about each other and I know I can depend on any of my colleagues should I ever need to. Outside of Fire Control SWFRS has an LGBT network which is headed up by our Diversity Officer, this is a good forum in which to network with other staff from this and other organisation. During my time in the Service, I have also taken on the role of LGBT representative for the Fire Brigades Union (FBU). The support I have received from this group has been invaluable. We meet on a yearly basis where FBU members who identify as LGBT meet in a safe environment. I have learnt so much from this group by talking to others and hearing about their experiences of working in different FRS’s around the UK. I also attend regular meetings with the FBU LGBT committee and I am a point of contact for any members in Wales that identfy as LGBT but perhaps feel isolated or even harrassed in their workplace. The FBU LGBT section ensure LGBT members have a voice within the FBU, making sure we are not left out in equality issues at Service, Regional and National Level. You are definitely not alone in South Wales Fire and Rescue Service and the support you will receive from colleagues, support groups, trade unions and friends is incredible.